Hey Dentist in Burlington, How Often Should I Come In? Just like your car needs routine maintenance, your smile requires a tune up from time to time. No matter how healthy your teeth are, you really do need to visit your dentist in Burlington twice per year. It’s a small investment in time for a big reward — a healthy smile that looks and feels great for a lifetime to come! But why is preventive dental care so important? And what can you expect from the checkup and cleaning at Complete Dental Care? Let’s take a closer look at the need for preventive care. Patients of all ages benefit from six month visits to the dentist. It’s almost always easier to prevent a problem from forming than it is to correct an existing issue, and that’s certainly true when it comes to your smile health. Partner with your dentist attending regular checkups and cleanings to keep issues like tooth decay, gum disease, broken dental work, and other oral health hazards at bay. If you see us every six months, you’re greatly reducing the risk that you’ll ever be surprised by a severe toothache or need serious restorative care. We will begin your routine dental appointment by taking x-rays if it’s time. Most people need x-rays taken annually. Then, your dental hygienist will clean off the biofilm that collects around your teeth and gums, and use special tools to take off tartar (the hard, yellow stuff you can see). 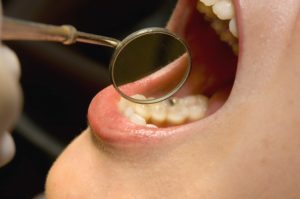 We will also talk to you about your oral health during this portion of the visit — do you have any particular concerns? Noticed anything different lately? Open communication helps us better protect your smile. Children are most vulnerable to tooth decay between ages 6 and 14 or so, and special preventive services like dental sealants and fluoride treatments can protect their tooth enamel from cavities. The dentist may also recommend an evaluation for the presence of wisdom teeth or to assess the need for early orthodontic intervention. If you have dental insurance, there’s really no excuse to skip out on your regular checkup and cleaning. Preventive dentistry is the best way to prevent the need for costly care later on, so your insurance plan should fully cover your twice-annual visits along with other special treatments for cavity prevention, like fluoride or dental sealants. Contact our team of experts to talk about what benefits you are eligible for with your dental insurance. To learn more about Dr. Kostas, take a few moments to watch his bio! Alongside , a member of the Tufts Dental faculty in the Operative Dentistry Department, they and the team at Complete Dental Care provide the ultimate in dental care for Burlington and all surrounding areas. When was your last visit to Complete Dental Care? If it’s been more than six months, don’t wait another day to get back on track for your oral health. Schedule a checkup and cleaning with our team today. Comments Off on Hey Dentist in Burlington, How Often Should I Come In?